Just hours after resigning from her role as broadcasting minister, Clare Curran came out swinging at the political editor of a state broadcaster on Twitter. And since then Curran has taken down her Twitter account. Curran's resignation yesterday followed a horror week in Parliament involving questions over her use of a personal email account for Government business. Curran says it was a personal choice to step down as minister rather than for political reasons. Earlier on Friday, Prime Minister Jacinda Ardern told Newstalk ZB she would not fire Curran, but she had accepted the MP's resignation the night before. Only hours later, the MP responded to a tweet posted by RNZ's political editor Jane Patterson. 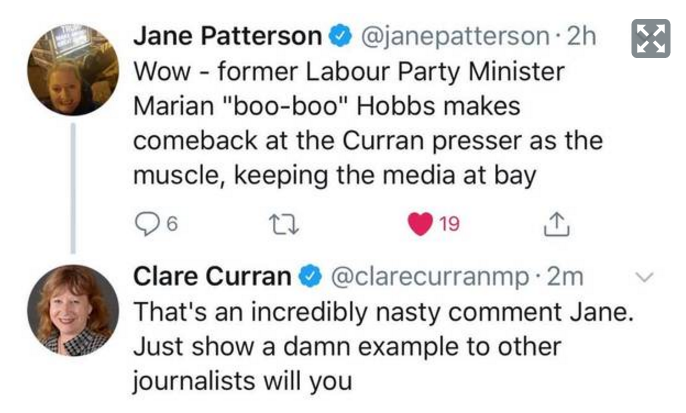 "Wow - former Labour Party Minister Marian "boo-boo" Hobbs makes comeback at the Curran presser as the muscle, keeping the media at bay," the original tweet read. Curran hit back at the tweet, calling it an "incredibly nasty comment". "Just show a damn example to other journalists will you," Curran's tweet ended. Curran's Twitter account, with the handle @clarecurranmp, has since been deleted. Comments on Patterson's original post largely echoed Curran's hostility towards the journalist's commentary. One called Patterson "just another bully" while another said called the comment "unprofessional". "Expect better from an RNZ Political Editor," it continued. The controversy around Curran's use of Gmail followed hot on the heels of an ongoing parliamentary scandal over Curran's failure to correctly diary two meetings. She was demoted from Cabinet over the issue at the end of last month, with Ardern commenting her "second misjudgement" was "not in keeping with [her] expectations". On Thursday, Curran took personal leave after a fumbling performance in Parliament in which she was questioned on her use of a Gmail account for Government business. She admitted that "from time to time, I have used my Gmail account. When using it, I adhere to my obligations as a minister." The under-fire Curran then quit as a minister on Friday, saying the pressure on her had become "intolerable". "I've made mistakes, they weren't deliberate undermining of the political system. "But my mistakes have been greatly amplified and the pressure on me has become intolerable," she said. Kris Faafoi would become the Minister of Broadcasting, Communications and Digital Media, remaining outside of Cabinet, and Peeni Henare will become the Associate Minister for ACC. The New Zealand Herald has contacted Curran for comment about the Twitter exchange.